So I immediatly thought about a Video application created with new Central AOL IM SDK instead I read that the video application was developed under the program known as ICQ Xtraz. ICQ enables you to conduct simple and easy to use Video chat sessions. Download the ICQ Video Xtraz. What is the ICQ Xtraz API ? The ICQ Xtraz API is a development platform that enables developers and businesses alike to create new and innovative features that can be seamlessly integrated into the ICQ 4 client. Currently the Xtraz API is available to developers or businesses who wish to partner with ICQ. ICQ Xtraz are web-based features that are seamlessly integrated into ICQ 4. An ICQ Xtraz feature that you create, as an ICQ partner, will be hosted on your site, and under certain limitations will be controlled and managed by you - so design, security and other aspects of your application or service, can be easily managed. In order to develop ICQ Xtraz features, you will need access to the development platform, the ICQ Xtraz API. Currently the Xtraz API is only made available to individual developers or businesses that partners with ICQ. "Central has yet to generate significant interest among developers, however, who have expressed concerns about usefulness and licensing terms." I read on Zdnet site that Yahoo is shutting down PayDirect, the payment system used by the new Central Try/Buy license model. The Try/Buy Distribution License permits developers to sell their Central apps using the Central Try/Buy infrastructure to promote them and handle payments transaction with the Yahoo! Payments service. All details about the model are here. The PayDirect service and web site will be completely discontinued on May 15, 2005. November 22, 2004 – After this date, you will no longer be able to send money or add funds to either your PayDirect account or to any WorldCards you have sent. However, you will be able to transfer your balance to your bank account and close your PayDirect account. Recipients of Worldcard ATM cards may continue to withdraw funds you have put into a sub-account prior to this date but you will not be permitted to put new funds in a sub-account. February 15, 2005 – All PayDirect accounts that have not already been closed by the account owner will automatically be closed, and the balance will be refunded. You will not be able to conduct any further transactions. The PayDirect web site will still be available for you to view your account history. May 15, 2005 – The Yahoo! PayDirect from HSBC service will be completely discontinued, and you will no longer be able to access the web site. What will happen to Central and the new License program ?????? Macromedia let us know, please ! With the release of Central 1.5 developers can integrate in their application AOL and ICQ Instant Messaging service using the AIM SDK. America Online is launching a program this week to promote and facilitate the creation of what it calls AIM Robots for its AIM instant messaging system. And >here you can find a list of existing AIM Bots. 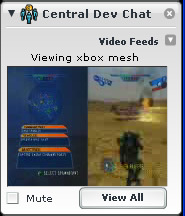 Today Mike Chamber and other MM people were going to be running some tests involving Flash Video, Xbox and DevChat. This is the video output captured in realtime from Mike Chamber's Xbox while playing with star wars battlefront game. Very cool application for Central enviroment ! It's a flash movie divided into 4 different categories of users : developer, homeuser, student and journalist. Simple, clear but it works ! i found this Central application in central mailing list post by Andrew D. Goodfellow. favorite recipes, and use those recipes to plan meals! Have a good dinner ! So we can see that Central 1.5 is the result of hard work by MM team. Help Macromedia to create the future for Rich Internet Application ! !